The drinking of wine can be likened to the listening of music. It’s nice to just be doing it, but you can get a lot more satisfaction if you pay attention. Just like music, wine comes in different varieties; you won’t find a taste you prefer unless you’ve been wine tasting a few times. And just like music, you develop a preference which you will use as a comparison point for other wines to come. The circumstances you’re in affect the tasting experience. For instance, a noisy room makes it difficult to focus. The presence of other scents can affect how you perceive a wine’s aroma. Even the glass you’re using changes how you taste the wine: anything too small, in the wrong shape, or not washed properly can affect the flavor of the wine. 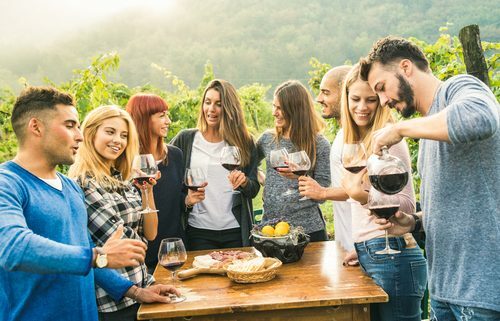 Other factors that pose a challenge to the tasting experience include wine temperature, the age of the wine, and the residual flavors of what you are eating or drinking. Since many factors pose a challenge to wine tasting, it helps to ensure the right conditions are met so you can properly assess what you’re drinking. Look down into the glass. Observe the depth of color as that lets you know the wine’s density and saturation as well as the kind of grape used. For example, a dark shade might be Syrah while a lighter shade could be Pinot Noir. View from the side. Doing this allows you to determine the wine’s clarity. Murky liquid may indicate problems with fermentation or it could have been shaken before it was poured. The best wines are clear and show some sparkle. Tilt the glass. This allows the liquid to thin out, giving you a better clue about the wine’s age and weight. Darker edges usually indicate an older wine. Swirl the glass. Check if there are “legs” or “tears”, the liquid that runs down the side of the glass. Good legs indicate more alcohol and glycerin, which means that the wine is riper and denser. Don’t be afraid to inhale deeply. The nose can distinguish around 10,000 scents so you really need to get a good sense of it. This might be a difficult step but you can always step away for about 20 to 30 seconds then try to give it another go. Take note of what your nose can detect: is it floral, fruity, pungent, spicy, or woody? While the nose can detect thousands of smells, the tongue can only discern four: sweet, sour, salty, and bitter. Sweetness, acidity, and tannin are used to describe a wine’s taste. Wines tend to be sour because of the acid from the grapes but the intensity depends on the kind of grape and the climate it was grown in. Bitter wines like Pinot Grigio offer a taste similar to tonic water while white table wines tend to be sweet because the sugars are retained. While sweetness and acidity are familiar, tannin leaves a dryness in the mouth after you swallow. You also need to take some time before moving to taste the next bottle of wine. Doing this ensures that your palette is clear so that you can have a better sense of the next wine you’re tasting. Wine tasting is about finding a flavor you like. Although it can be a subjective affair, you can always compare observations with fellow wine tasters to get a different perspective. For more information on where to store your favorite wines, contact Chateau 55 today!